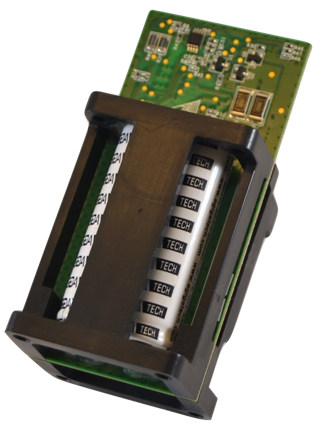 PowerGEM® is an intelligent power supply utilizing ultracapacitor technology as the power source, for an environmentally friendly solution when compared to batteries. PowerGEM also provides in-system health monitoring and tracking for a highly reliable solution that will operate over the life of the system without conditioning or replacement. The Amber/Amber4X product family incorporates the latest in hybrid supercapacitor technology to enable small form factor modules that can support backup power for a single or multiple NVDIMMs. High energy density in a compact form factor like a battery, high reliability and long lifetime like a supercap. Get the best of both worlds! The Amber/Amber4X family comes in multiple form factors, like a 2.5″ drive (SFF-8201) or half-height, half-length (HHHL) PCIe card. In addition, AgigA has developed a simple management and control interface that can enable a central power mode option. In this mode, a host server system can provide 12V power to the DIMM sockets directly during a power loss event, much like a micro-UPS (Uninterruptible Power Supply). This eliminates the need for any external cable connections from the NVDIMM modules to the PowerGEM. AgigA Tech has established a reliability test lab in Chengdu, China and has been continuously testing supercapacitors for more than a decade amassing a significant amount of test data that is unmatched in the industry. The test lab continues to run 24 hours a day, 7 days a week. We have tested the supercap offerings of multiple manufacturers, at extended operating temperatures and voltages. Our goal is to basically “break” the supercaps, so that we may understand the failure modes and reliability of each. After all, not all supercaps are equal, just like we see with batteries. Based on this extensive test data, we then select the most reliable supercap products to incorporate into our PowerGEM modules. AgigA has shipped more than 2.5 million supercaps to the field to date, without a single return due to a failed cell. We’ve now extended this test methodology to the newer hybrid supercap cells, and with more than 2 years of testing, have now qualified those cells for production. Datasheets and technical specs are available under NDA through our online documents portal. If you would like access, please e-mail us at info@agigatech.com.